Farmers saying they are being paid less than it costs them to produce the commodity. FARMERS ARE BEING paid less for their milk than it costs them to produce the staple after a collapse in global demand for dairy. British farmers have been protesting across the country at the below-cost returns with groups leading cows through to the dairy aisle and buying up all the milk in major supermarket chains to complain about “unfair” pricing. They were paid an average of below 24p (€0.34) per litre for their milk in June despite needing about 30p (€0.42) to break even. Prices have continued to fall further through July. Meanwhile in Ireland, the Irish Farmers’ Association (IFA) has warned one-third of dairy farmers could find themselves selling at negative margins for 2015 as a whole. Global milk prices have collapsed with a sudden drop-off in the demand from China for powdered products, as well as the impact of a Russian embargo on Western food imports. Last week the GlobalDairyTrade price index, the main benchmark for world milk prices, hit its lowest point in 13 years. While farmers in Ireland are some of the most efficient milk producers in Europe, they are far from immune from those falling returns. In its recent market update, Teagasc said dairy commodity prices were up to 40% lower this year than in 2014 although the weak euro had protected producers to an extent. It predicted incomes on the average dairy farm would drop over 40% on last year’s returns from over €67,000 to between €35,000 and €40,000. Local dairy farmers have been unshackled from EU milk quotas since earlier this year and there has been a big increase in Irish output, as well as from major producers like the US and New Zealand in recent months. Plentiful dairy product supplies have not been backed by strong dairy product demand over the last 12 months,” Teagasc said. IFA president Eddie Downey called on dairy co-ops to do whatever they could to “stop the milk price slide” by making their own processes more efficient. IFA continues to work hard at home and in Brussels to secure a review of the intervention ‘safety net’ level to help put a more realistic floor under markets, and we are demanding that superlevy funds be used to support farmers through this difficult period,” he said. Email “There are cows in supermarkets as people lose the plot over the price of milk”. 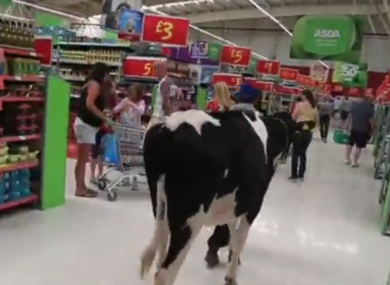 Feedback on “There are cows in supermarkets as people lose the plot over the price of milk”.